Business analysts are great problem solvers! They turn challenges into opportunities. They introduce change. They help companies identify issues and implement solutions to improve overall performance. A qualified business analyst can make a huge difference for pretty much any company. Although the job description of a business analyst will vary depending on every company and industry, the primary role remains the same – to help business owners achieve more. From inventory management to corporate structure areas, business analysts work hard to make sure their company thrives under today’s tough market conditions. The nature of this position assumes a variety of responsibilities as well as specific business knowledge which makes resume writing even more complex process. 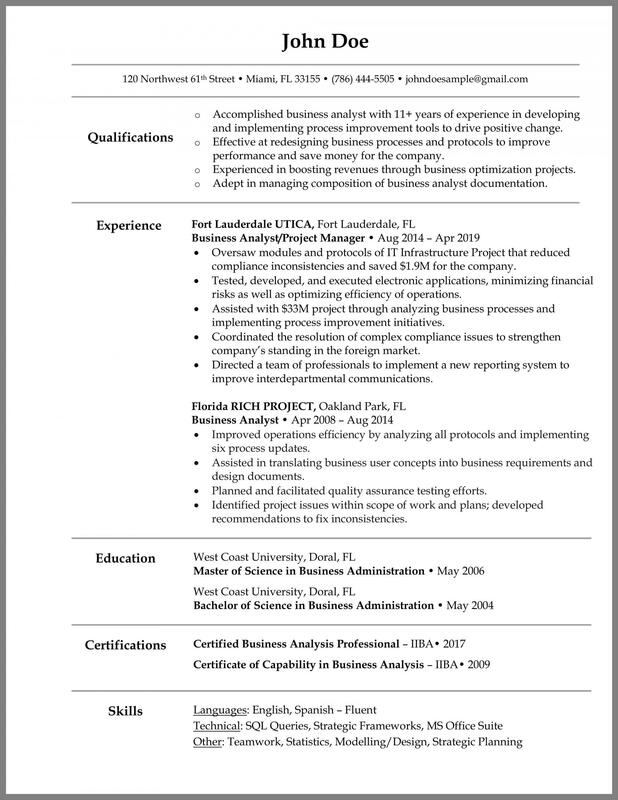 How to Write a Business Analyst Resume? Good business analysts make a huge difference for companies they work for. Unfortunately, it is not always easy to translate business analyst experience on a resume. Besides, there are other resume writing challenges job seekers need to be aware of (i.e. what resume format to choose, how to highlight accomplishments, etc.). To help you understand how you can effectively organize your skills, experience, and education on your business analyst resume, we have developed a couple of recommendations that will help you position yourself as a strong BA candidate. Many business analyst job seekers approach resume writing challenge just like most of other people looking for a job – they list their experiences in a reverse chronological order, including their educational credentials and skills. While there is no problem with doing these things, job seekers need to focus on the results of your work more than what they did. The ultimate success of every business analyst is to introduce positive change to help businesses improve their performance and achieve commercial and organizational goals. That said, employers pay attention to results which means you will have to mention some performance details and quantify your achievements (i.e. “Implemented process improvement tools that helped the company reduce refund requests by 27% and save $1.7M”). What Format Works Best for a Business Analyst Resume? Because a business analyst resume should be focused on results, one can pick either a combined or a reverse chronological format. If you don’t have much BA experience, it is better to pick a reverse chronological option. This will help you highlight your recent experiences and job titles. On the other hand, if you are a seasoned BA expert, choose a combined resume format where you can show off both your relevant skills and work experience. The truth of the matter is that an HR who will be reviewing your application most likely has a pretty vague understanding of what business analyst role entails so there is a good chance that important details will be lost to them. The challenge then is to translate your accomplishments into an easy to understand language. Try to avoid heavy technical jargon and focus on how you helped businesses improve their standing in simple terms. Business analysts work in different industries and under multiple job titles (i.e. Product Manager, IT Analyst, Domain Consultant, etc.). BA professionals need to be selective and focus on those projects and experiences which appear to be the most relevant to the target job. Hiring authorities don’t need to know your entire employment history and details of jobs that have nothing to do with that they are looking for. You may be a jack of all trades but companies seek to hire a business analyst with specific industry and business knowledge. So it will more sense if you focus on what employers want to see as opposed to showing off all of your strengths.